A couple of weeks ago we had a family meal at one of Brisbane's oldest hotels. I'm not a restaurant reviewer, but I have to say that I was very impressed with the venue and the food. I am talking about the recently refurbished Royal Hotel at Nundah, which happens to be on the BCC heritage list. The suburb now known as Nundah started out as German Station, a place established by Lutheran missionaries who were among Brisbane's first free settlers. They arrived in 1838 and the mission lasted until 1843. 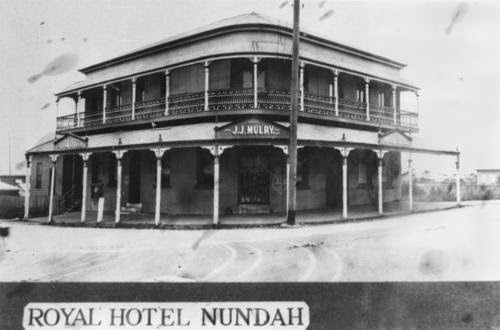 A railway station was opened in 1882 and with that came a new name for the suburb - Nundah, an adaptation of the name that the Indigenous Turrbal people had for a chain of waterholes in the area. The Royal Hotel was designed by architect GWC Wilson and built on Sandgate Road around 1888. It has remained a Nundah fixture since that time. Here is the earliest photograph of it that I could find - it was taken around 1929. Prior to a makeover last year, the hotel had marketed itself as the Royal English Hotel and it looked like this. Fortunately all of that faux-Tudor cladding is now gone. And here is its most recent appearance. Now known simply as The Royal, it has embraced the gastro-pub concept with an Italian flair. Judging by the full-to-capacity crowd, the changes have met with instant approval and The Royal has regained its mojo. Yes, the hotel is operated by Spirit Hotels, which is a division of the mammoth Coles Group. I wasn't aware of that when I visited the place and the whole experience was excellent, so I have no beef with the ownership setup. I think the days of the corner pub owned and run by a family or two are just about gone. But these huge organisations can provide a large number of jobs, especially for young people.